Windies batsman Shimron Hetmyer smashed a whirlwind 103 from 69 balls which cruised Guyana Jaguars to their second win as many matches when Cricket West Indies (CWI) Super50 Cup continued on Friday. Playing at the Sir Vivian Richards Cricket Ground, in Antigua, Jaguars pounced on the inexperienced United States, ravaging them by eight wickets and 17.4 overs to spear in pursuit of 189. Entering at 1-19 in the seventh over due to the dismissal of Chandrapaul Hemraj for seven, Hetmyer who just had 19 in his previous match against Kent, took a liking to all the bowlers in his attractive innings which gave him his first List A century. The left-hander smashed eight fours and seven sixes, sharing a 118-run partnership with captain Leon Johnson which came off 96 balls for the second wicket. Johnson who failed to trouble the scores in the previous match, seemed busy at the crease in his unbeaten 50 (4x4s; 1×6) which came off 63 balls. When the Berbician departed in the 28th over, Raymon Reifer spent little time in smashing a boundary to secure the comfortable victory. Earlier, United States captain Ibrahim Khaleel called right at the toss but it went wrong from then by losing wickets in a cluster. 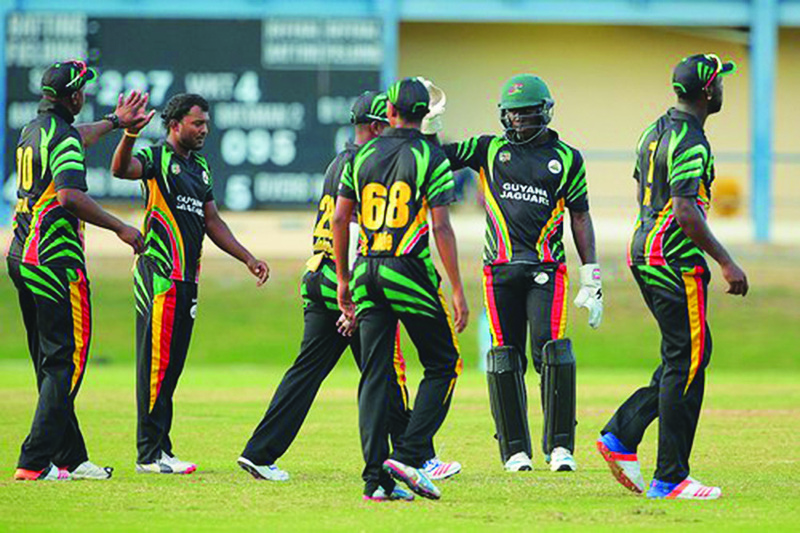 They slumped to 3-10 until former Windies batsman Xavier Marshall and Timil Patel added 60 for the fourth wicket. The right-handed Marshall had to be patient for 51 which came off 83 balls and just had five fours and one maximum. Patel too failed to get going as his score of 16 came from 41 deliveries. The lack of scoring was attributed to tight bowling especially by spin twins Veerasammy Permaul and Devendra Bishoo who combined to bowl 20 overs for 34 runs and three wickets. Lower-order hitting by Mrunal Patel and Elmore Hutchinson helped their team to the respectable total against a well-rounded bowling output by the Jaguars. Meanwhile, the Guyana Cricket Board via a release on Friday afternoon revealed that all-rounder Christopher Barnwell will replace Reifer who leaves the squad after their match on Sunday for Windies ‘A’ team duties. On Sunday, Jaguars play Leeward Hurricanes in day/night affair at the Coolidge Cricket Ground, commencing from 14:00 hrs. February 3, 2018 in Regional Cricket.